Today is the birthday (1201) of Khawaja Muhammad ibn Muhammad ibn Hasan Tūsī (Persian: محمد بن محمد بن الحسن طوسی‎‎), better known as Nasīr al-Dīn Tūsī (Persian: نصیر الدین طوسی‎)‎; or simply Tusi in the West, a Persian polymath and prolific writer – an architect, astronomer, biologist, chemist, mathematician, philosopher, physician, physicist, scientist, and theologian. The Muslim scholar Ibn Khaldoun (1332–1406) http://www.bookofdaystales.com/ibn-khaldoun/ considered Tusi to be the greatest of the later Persian scholars. Tusi was born in the city of Tus in medieval Khorasan (in north-eastern Iran) and began his studies at an early age. In Hamadan and Tus he studied the Qur’an, Hadith, Shi’a jurisprudence, logic, philosophy, mathematics, medicine and astronomy. He was apparently born into a Shī‘ah family and lost his father at a young age. Fulfilling the wish of his father, the young Tusi took learning and scholarship very seriously and travelled far and wide to attend the lectures of renowned scholars and acquire the knowledge, an exercise highly encouraged in his Islamic faith. At a young age he moved to Nishapur to study philosophy under Farid al-Din Damad and mathematics under Muhammad Hasib. He met also Farid al-Din ‘Attar, the legendary Sufi master who was later killed by Mongol invaders and attended the lectures of Qutb al-Din al-Misri. 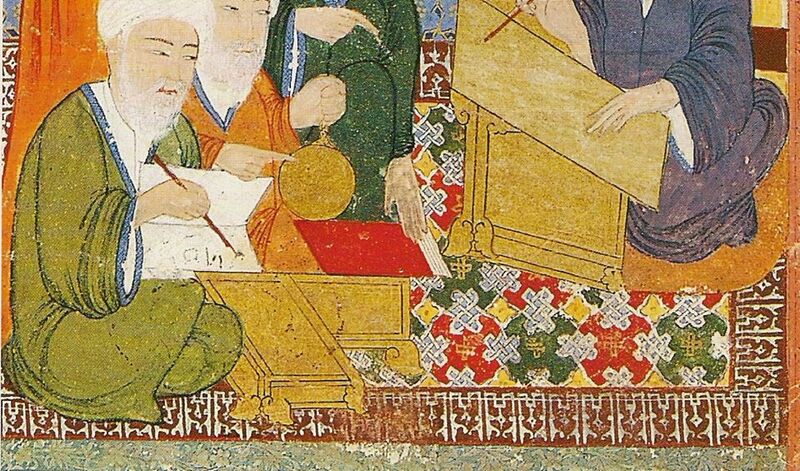 In Mosul he studied mathematics and astronomy with Kamal al-Din Yunus (d. 1242). 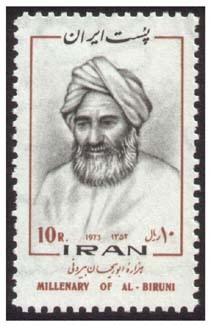 Later on he corresponded with Sadr al-Din al-Qunawi, the son-in-law of Ibn al-‘Arabi, and it seems that mysticism, as propagated by Sufi masters of his time, was not appealing to his mind and once the occasion was suitable, he composed his own manual of philosophical Sufism in the form of a small booklet entitled Awsaf al-Ashraf “The Attributes of the Illustrious”. As the armies of Genghis Khan swept his homeland, he was employed by the Ismailis and made his most important contributions in science during this time when he was moving from one stronghold to another. He was captured after the invasion of the Alamut castle by the Mongol forces. Kitāb al-Shakl al-qattāʴ Book on the complete quadrilateral. A five volume summary of trigonometry. Al-Tadhkirah fi’ilm al-hay’ah – A memoir on the science of astronomy. Many commentaries were written about this work called Sharh al-Tadhkirah (A Commentary on al-Tadhkirah) – Commentaries were written by Abd al-Ali ibn Muhammad ibn al-Husayn al-Birjandi and by Nazzam Nishapuri. Akhlaq-i Nasiri – A work on ethics. 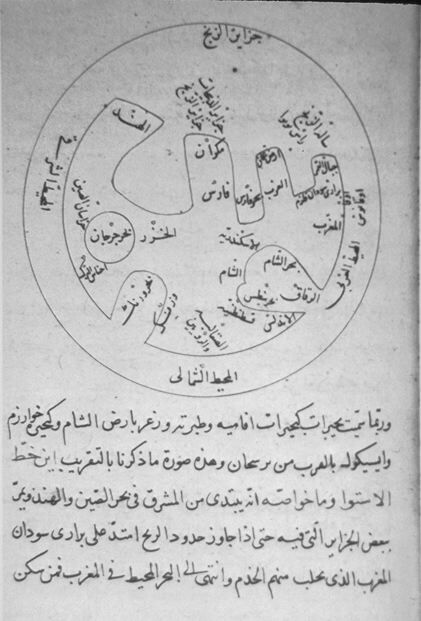 al-Risalah al-Asturlabiyah – A Treatise on the astrolabe. Zij-i ilkhani (Ilkhanic Tables) – A major astronomical treatise, completed in 1272. Tajrīd al-iʿtiqād (Summation of Belief) – A commentary on Shia doctrines. Talkhis Al Mohassal(summary of summaries). During his stay in Nishapur, Tusi established a reputation as an exceptional scholar. “Tusi’s prose writing, which number over 150 works, represent one of the largest collections by a single Islamic author. Tusi convinced Hulegu Khan to construct an observatory for establishing accurate astronomical tables for better astrological predictions. Beginning in 1259, the Rasad Khaneh observatory was constructed in Azarbaijan, south of the river Aras, and to the west of Maragheh, the capital of the Ilkhanate Empire. 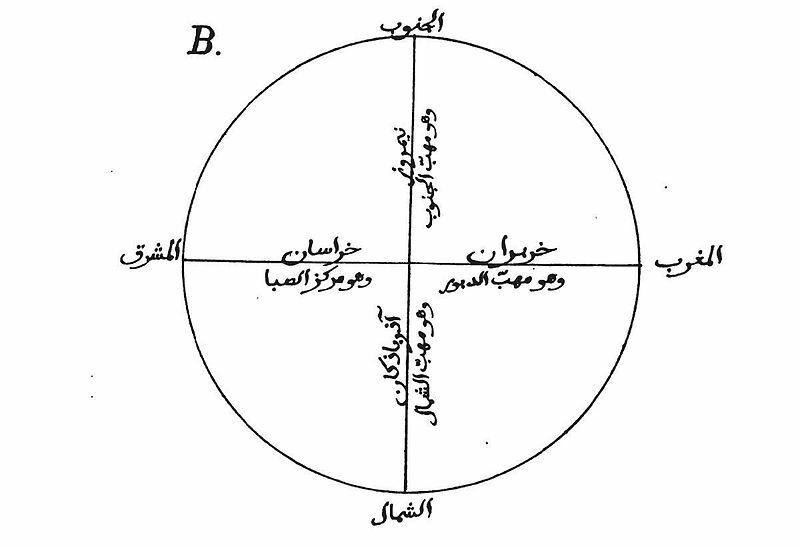 Based on the observations in this for the time being most advanced observatory, Tusi made very accurate tables of planetary movements as depicted in his book Zij-i ilkhani (Ilkhanic Tables). This book contains astronomical tables for calculating the positions of the planets and the names of the stars. His model for the planetary system is believed to be the most advanced of his time, and was used extensively until the development of the heliocentric model in the time of Nicolaus Copernicus. Between Ptolemy and Copernicus, he is considered to be one of the most eminent astronomers of his time. For his planetary models, he invented a geometrical technique called a Tusi-couple, which generates linear motion from the sum of two circular motions. He used this technique to replace Ptolemy’s problematic equant for many planets, but was unable to find a solution to Mercury’s motion, which was solved later by Ibn al-Shatir as well as Ali Qushji. The Tusi couple was later employed in Ibn al-Shatir’s geocentric model and Nicolaus Copernicus’ heliocentric model. He also calculated the value for the annual precession of the equinoxes and contributed to the construction and usage of some astronomical instruments including the astrolabe. Ṭūsī criticized Ptolemy’s use of observational evidence to show that the Earth was at rest, noting that such proofs were not decisive. Although it doesn’t mean that he was a supporter of the motion of the earth, as he and his 16th-century commentator al-Bīrjandī, maintained that the earth’s immobility could be demonstrated, but only by physical principles found in natural philosophy. Tusi’s criticisms of Ptolemy were similar to the arguments later used by Copernicus in 1543 to defend the Earth’s rotation. About the essence of the Milky Way, Ṭūsī in his Tadhkira writes: “The Milky Way, is made up of a very large number of small, tightly-clustered stars, which, on account of their concentration and smallness, seem to be cloudy patches. Because of this, it was likened to milk in color.” Three centuries later the proof of the Milky Way consisting of many stars came in 1610 when Galileo used a telescope to study the Milky Way and discovered that it is really composed of a huge number of faint stars. The organisms that can gain the new features faster are more variable. As a result, they gain advantages over other creatures. . . . The bodies are changing as a result of the internal and external interactions. Look at the world of animals and birds. They have all that is necessary for defense, protection and daily life, including strengths, courage and appropriate tools [organs]. Some of these organs are real weapons. For example, horns-spear, teeth and claws-knife and needle, feet and hoofs-cudgel. The thorns and needles of some animals are similar to arrows. Animals that have no other means of defense (as the gazelle and fox) protect themselves with the help of flight and cunning. Some of them, for example, bees, ants and some bird species, have united in communities in order to protect themselves and help each other. Such humans [probably anthropoid apes] live in the Western Sudan and other distant corners of the world. They are close to animals by their habits, deeds and behavior. The human has features that distinguish him from other creatures, but he has other features that unite him with the animal world, vegetable kingdom or even with the inanimate bodies. Before [the creation of humans], all differences between organisms were of the natural origin. The next step will be associated with spiritual perfection, will, observation and knowledge. All these facts prove that the human being is placed on the middle step of the evolutionary stairway. According to his inherent nature, the human is related to the lower beings, and only with the help of his will can he reach the higher development level. A body of matter cannot disappear completely. It only changes its form, condition, composition, color and other properties and turns into a different complex or elementary matter. Tusi was the first to write a work on trigonometry independently of astronomy. In his Treatise on the Quadrilateral, gave an extensive exposition of spherical trigonometry, distinct from astronomy. It was in these works that trigonometry achieved the status of an independent branch of pure mathematics distinct from astronomy, to which it had previously been linked. In his On the Sector Figure, appears the famous law of sines for plane triangles. He also stated the law of sines for spherical triangles, discovered the law of tangents for spherical triangles, and provided proofs for these laws. 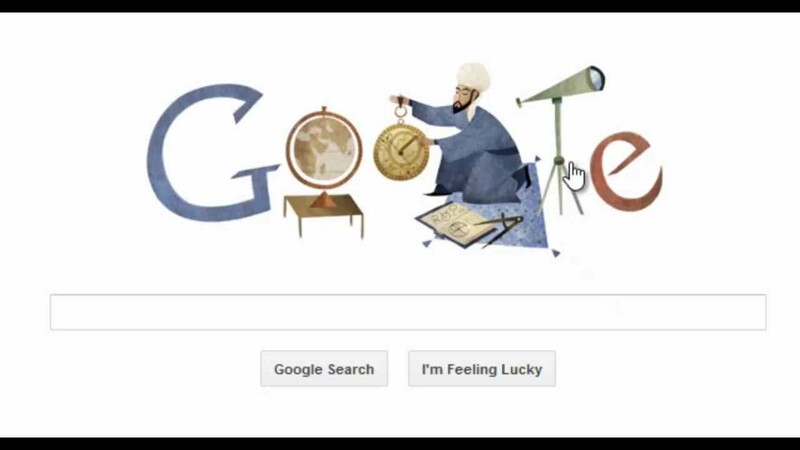 In February 2013, Google celebrated his 812th birthday with a doodle, which was accessible in its websites with Arabic language calling him al-farsi (the Persian). Arils are the seeds, which act as a garnish. 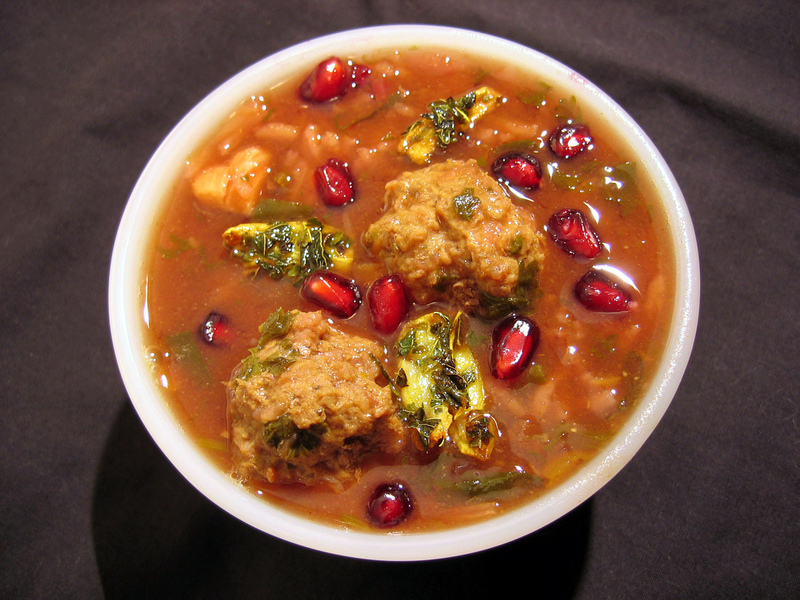 Pomegranate soup, or āsh-e anār, is a Persian and Mesopotamian dish (āsh) made from pomegranate juice and seeds, yellow split peas, rice, spices, and vegetables. It likely has ancient roots. It is generally more flavorful if you can find pomegranate syrup, but the pure juice will do. Heat the olive oil in a large, heavy stock pot on medium heat. Add the parsley, cilantro, spinach and leek, and sauté for 10 minutes to wilt. Do not allow them to take on color. Add the stock and lemon juice and bring to a simmer. Add the rice and split peas. Cook on a low heat until the rice is done (about 30 minutes). The split peas will cook at about the same time. Add the pomegranate syrup and sugar. Season to taste with salt and pepper and simmer for another 10 minutes. 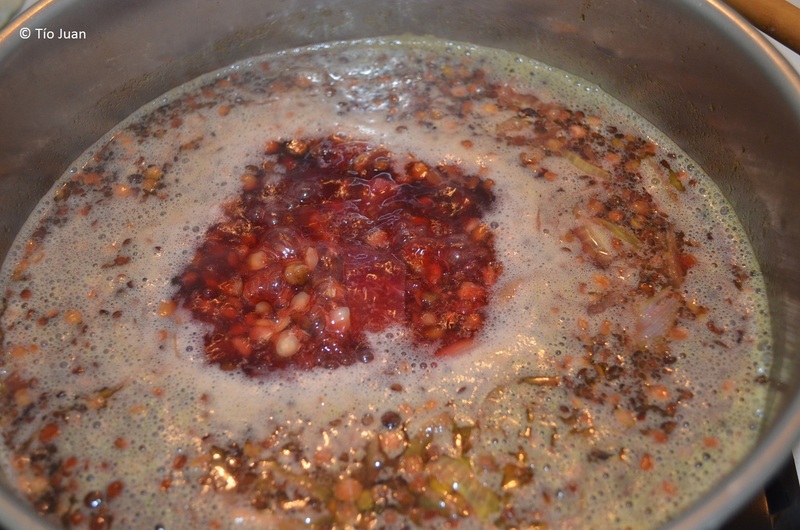 Pour the soup into deep bowls and garnish with about 1 tablespoon of pomegranate arils per bowl. 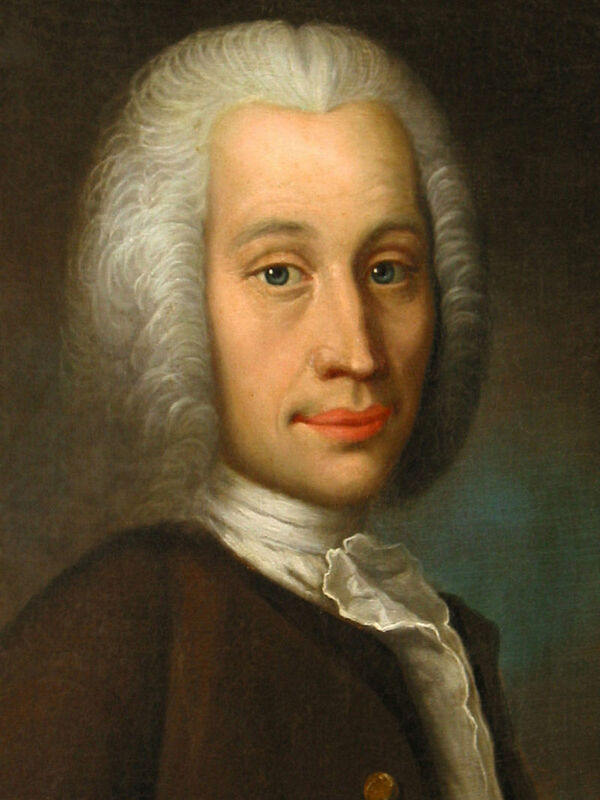 Today is the birthday (1701) of Anders Celsius, a Swedish astronomer, physicist and mathematician. He was professor of astronomy at Uppsala University from 1730 to 1744, but traveled from 1732 to 1735 visiting notable observatories in Germany, Italy and France. He founded the Uppsala Astronomical Observatory in 1741, and in 1742 proposed a temperature scale which now bears his name. Celsius was born in Uppsala in Sweden, but his family originated from Ovanåker in the province of Hälsingland. 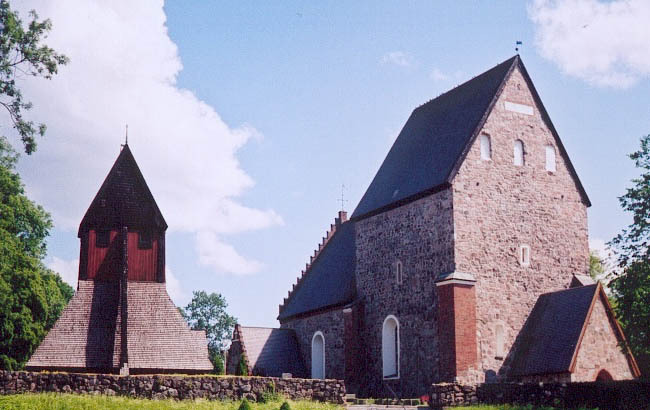 Their family estate was at Doma, also known as Höjen or Högen (locally as Högen 2). The name Celsius is a latinization of the estate’s name (Latin celsus “mound”). 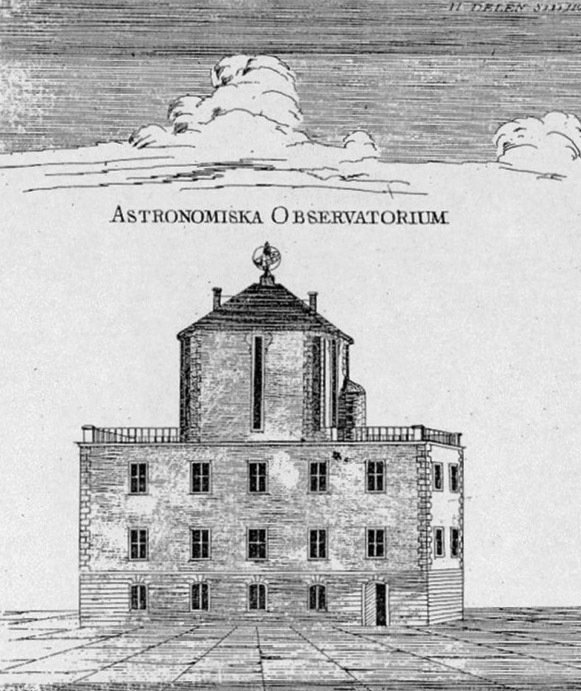 Celsius traveled frequently in the early 1730s, including to Germany, Italy and France, when he visited most of the major European observatories. In Paris he advocated the measurement of an arc of the meridian in Lapland. In 1736, he participated in the expedition organized for that purpose by the French Academy of Sciences, led by the French mathematician Pierre Louis Maupertuis (1698–1759) to measure a degree of latitude. The aim of the expedition was to measure the length of a degree along a meridian, close to the pole, and compare the result with a similar expedition to Peru, near the equator. The expeditions confirmed Isaac Newton’s belief that the shape of the earth is an ellipsoid flattened at the poles. In 1738, he published the De observationibus pro figura telluris determinanda (Observations on Determining the Shape of the Earth). Celsius’ participation in the Lapland expedition won him much respect in Sweden with the government and his peers, and played a key role in generating interest from the Swedish authorities in donating the resources required to construct a new modern observatory in Uppsala. He was successful in the request, and Celsius founded the Uppsala Astronomical Observatory in 1741. The observatory was equipped with instruments purchased during his long voyage abroad, comprising the most modern instrumental technology of the period. In astronomy, Celsius began a series of observations using colored glass plates to record the magnitude (a measure of brightness) of certain stars. This was the first attempt to measure the intensity of starlight with a tool other than the human eye. He made observations of eclipses and various astronomical objects and published catalogs of carefully determined magnitudes for some 300 stars using his own photometric system (mean error=0.4 mag). Celsius was the first to perform and publish careful experiments aiming at the definition of an international temperature scale on scientific grounds. In his Swedish paper “Observations of two persistent degrees on a thermometer” he reports on experiments to check that the freezing point is independent of latitude (and of atmospheric pressure). He determined the dependence of the boiling of water on atmospheric pressure which was accurate even by modern day standards. He further gave a rule for the determination of the boiling point if the barometric pressure deviates from a certain standard pressure. He proposed the Celsius temperature scale in a paper to the Royal Society of Sciences in Uppsala, the oldest Swedish scientific society, founded in 1710. His thermometer was calibrated with a value of 100° for the freezing point of water and 0° for the boiling point. 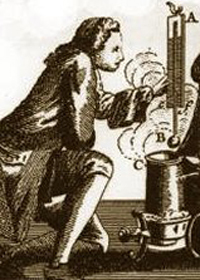 In 1745, a year after Celsius’ death, the scale was reversed by Carl Linnaeus to facilitate more practical measurement. 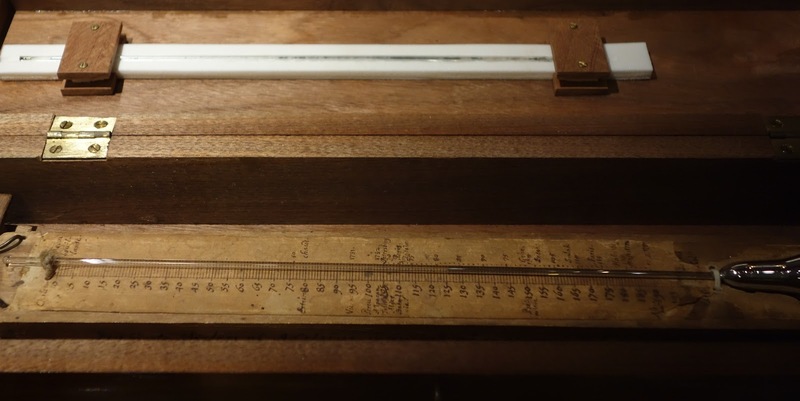 Celsius originally called his scale “centigrade” derived from the Latin for “hundred steps”. For years it was simply referred to as the Swedish thermometer. Celsius conducted many geographical measurements for the Swedish General map, and was one of earliest to note that much of Scandinavia is slowly rising above sea level, a continuous process which has been occurring since the melting of the ice from the latest ice age. However, he wrongly posited the notion that the water was evaporating. In 1725 he became secretary of the Royal Society of Sciences in Uppsala, and served at this post until his death from tuberculosis in 1744. Here’s a map of the world showing all the nations that use the Celsius scale, and those that use the Fahrenheit scale. Hmmmm. Barely visible are the Bahamas, Belize, the Cayman Islands, and the Republic of Palau. 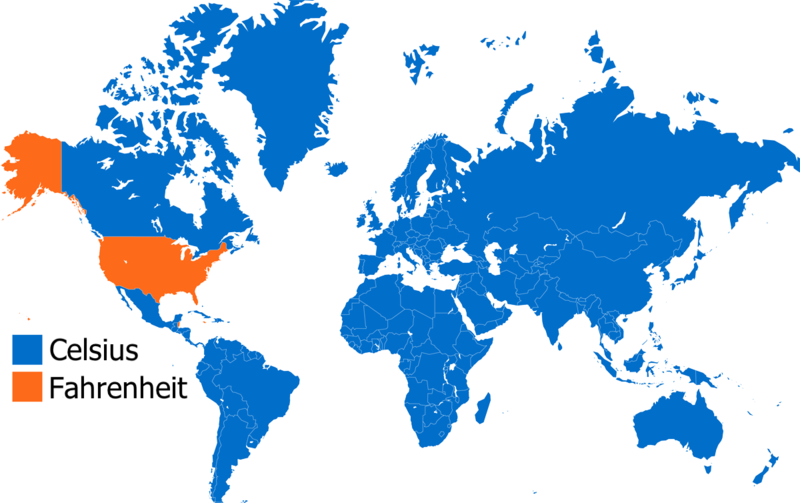 This is why I often use both Celsius and Fahrenheit in my recipes (sop to the USA). Anyway, I’m slightly haphazard about metric versus imperial measure in general because I’m not a big fan of precision in cooking in general (except baking). It’s hard enough for me to include measures at all. With oven temperatures I give exact measures because ovens come that way, but I don’t think in those terms. I think in heuristic terms, such as hot, medium, etc. Partly this is because ovens are so variable. At one time I used an internal oven thermometer, but these days I wing it. My oven in China never got hot enough for me, and my current one seems to have two settings – furnace and off. I manage. The cloudberry (Rubus chamaemorus) is native to Sweden and very popular there. Sadly, it is very difficult to cultivate, so it’s almost impossible to find fresh cloudberries outside of northern latitudes. Nonetheless, I am going to give you a recipe for cloudberry ice cream made with fresh berries. Slightly modified, this recipe can be made with cloudberry preserves, which are much more easily found worldwide. I am choosing ice cream for today’s celebration because Celsius determined that the freezing point of pure water was invariant (and so became one end of his temperature scale). Also, Swedes are the heaviest consumers of ice cream in the world. 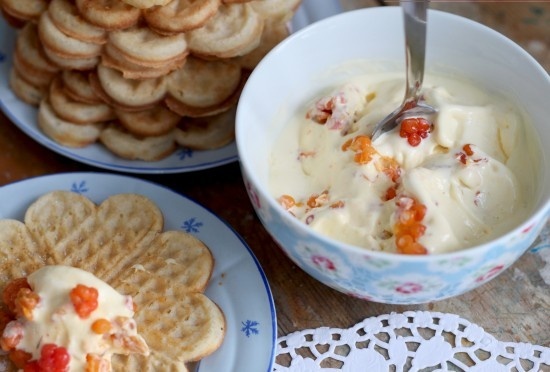 Cloudberry ice cream and chilled cloudberry cream are common favorites. Cook the berries and ¼ cup of sugar in a medium saucepan over medium heat until the berries are soft and starting to release their juices. Increase the heat to medium-high and bring to a boil. Boil, stirring occasionally to prevent sticking, until the mixture thickens slightly, about 5 minutes. Set aside ½ cup of sauce. Purée the remaining sauce in a blender until smooth, and strain through a fine-mesh sieve into a measuring glass (you should have about 1 cup). Let cool. Whisk the egg yolks, a pinch of salt, and the remaining ½ cup sugar in a medium bowl until lightened in color. Bring 1 cup of cream to a boil in a medium saucepan. Immediately remove from the heat and very gradually whisk half of the cream into the egg yolk mixture. Be very careful here because you can easily scramble the egg. Whisking constantly, add the egg mixture to the remaining cream in the pan and then cook over medium heat, stirring constantly, until the custard is thickened, about 2 minutes. Strain through a fine-mesh sieve into a large bowl. Chill until cold. Whisk the custard, berry purée, lemon juice, and remaining ½ cup of cream until smooth. Process in an ice cream maker of your choice. Spoon in the reserved berry sauce, then scrape the ice cream into an airtight container (you want nice streaks of sauce still visible). Cover and freeze until firm, at least 2 hours. Today is the birthday (1394) of Mīrzā Muhammad Tāraghay bin Shāhrukh (Chagatai: میرزا محمد طارق بن شاہ رخ, Persian: میرزا محمد تراغای بن شاہ رخ‎‎) better known as Ulugh Beg (الغ‌ بیگ) a ruler in the Timurid dynasty in Central Asia as well as an astronomer, mathematician and sultan. His commonly used name, Ulugh Beg, is not a personal name, but rather a nickname, which can be loosely translated as “Great Ruler” or “Patriarch Ruler” and was the Turkic equivalent of Timur’s Perso-Arabic title Amīr-e Kabīr. Ulugh Beg was also notable for his work in astronomy-related mathematics, such as trigonometry and spherical geometry. 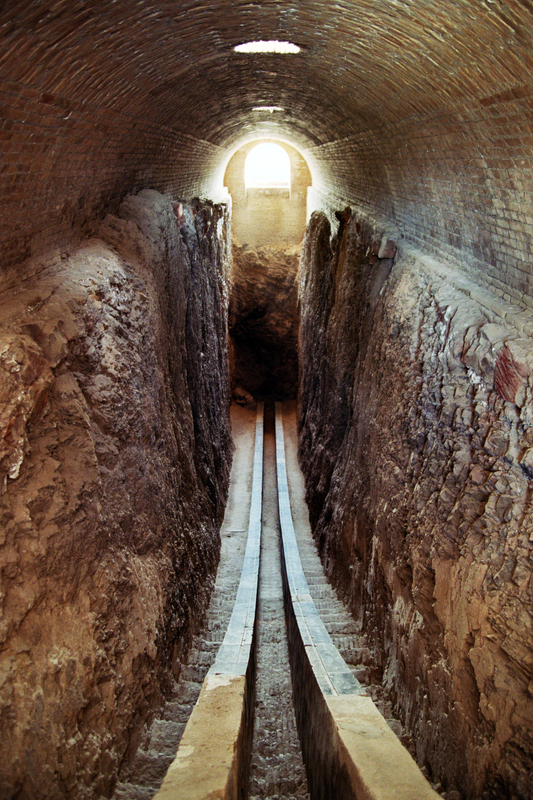 He built the great Ulugh Beg Observatory in Samarkand between 1424 and 1429. It was considered by scholars to have been one of the finest observatories in the Islamic world at the time and the largest in Central Asia. He built the Ulugh Beg Madrasah (1417–1420) in Samarkand and Bukhara, transforming the cities into cultural centers of learning in Central Asia. He was also a mathematics genius of the 15th century — albeit his mental aptitude was perseverance rather than any unusual endowment of intellect. 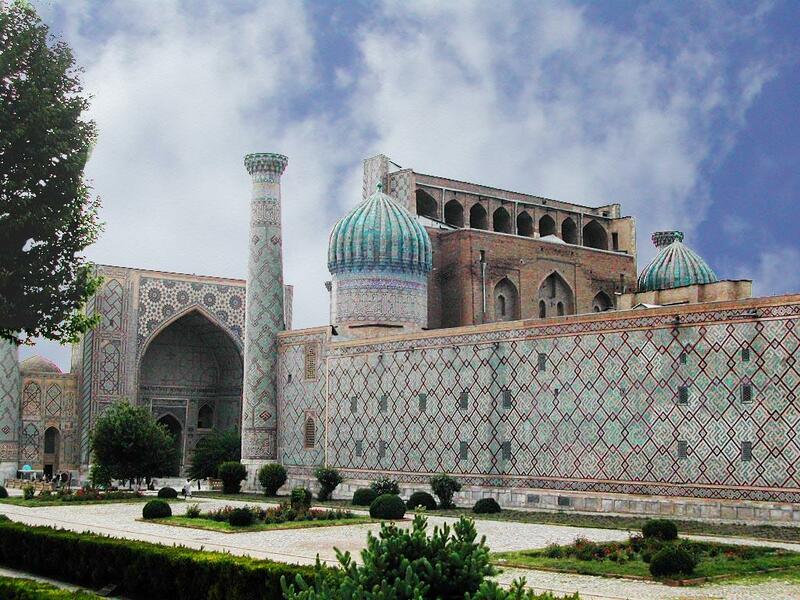 His observatory is situated in Samarkand which is in Uzbekistan. 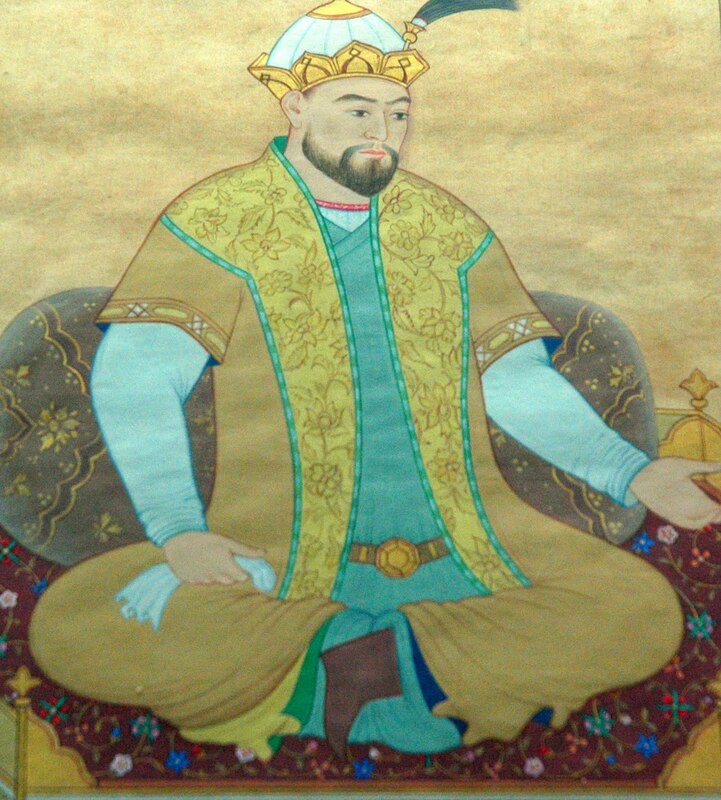 He ruled Uzbekistan, Tajikistan, Turkmenistan, Kyrgyzstan, southern Kazakhstan and most of Afghanistan for almost half a century from 1411 to 1449. He was a grandson of the great conqueror, Timur (Tamerlane) (1336–1405), and the oldest son of Shah Rukh, both of whom came from the Turkic Barlas ethnic group of Transoxiana (now Uzbekistan). His mother was a noblewoman named Goharshad, from the Turkic aristocracy of Giyasitdin Tarhan. Ulugh Beg was born in Sultaniyeh in Persia during Timur’s invasion. As a child he traveled through a substantial part of the Middle East and India as his grandfather expanded his conquests in those areas. After Timur’s death, however, and the accession of Ulugh Beg’s father to much of the Timurid Empire, he settled in Samarkand, which had been Timur’s capital. After Shah Rukh moved the capital to Herat (in modern Afghanistan), sixteen-year-old Ulugh Beg became his governor in Samarkand in 1409. In 1411, he became the sovereign ruler of the whole Mavarannahr khanate. The teenaged ruler set out to turn the city into an intellectual center for the empire. 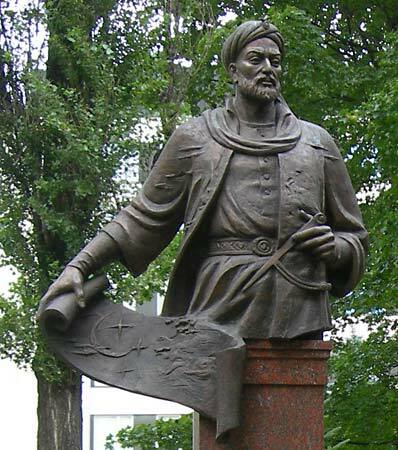 Between 1417 and 1420, he built a madrasah (“university” or “institute”) on Registan Square in Samarkand (currently in Uzbekistan), and he invited numerous Islamic astronomers and mathematicians to study there. The madrasah building still survives. 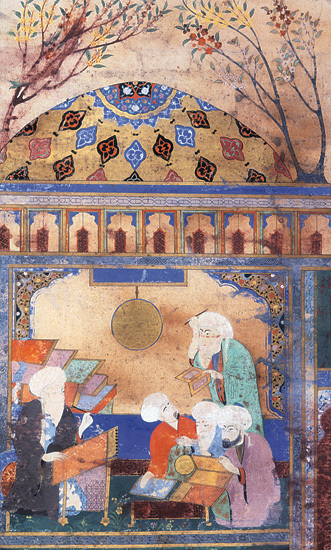 Ulugh Beg’s most famous pupil in astronomy was Ali Qushchi (died in 1474). He was also famous in the fields of medicine and poetry. He used to debate with other poets, regarding a range of contemporary issues. He liked to debate in a poetic style, called “Bahribayt” among local poets. Ulugh Beg proposed that a mixture of alcohol with garlic, could help treat conditions like diarrhea, headache, stomach ache, and intestinal illnesses. He also offered advice for newly married couples, suggesting recipes containing nuts, dried apricot, dried grape etc. were useful in increasing a man’s virility. Fortunately his astronomy and mathematics were stronger than his medical skills. His own particular interests concentrated on astronomy, and, in 1428, he built an enormous observatory, called the Gurkhani Zij, similar to Tycho Brahe’s later Uraniborg as well as Taqi al-Din’s observatory in Istanbul. Lacking telescopes to work with, he increased his accuracy by increasing the length of his sextant; the so-called Fakhri sextant had a radius of about 36 meters (118 feet) and the optical separability of 180″ (seconds of arc). Using it, he compiled the 1437 Zij-i-Sultani of 994 stars, generally considered the greatest star catalog between those of Ptolemy and Brahe, a work that stands alongside Abd al-Rahman al-Sufi’s Book of Fixed Stars. The serious errors which he found in previous Arabian star catalogs (many of which had simply updated Ptolemy’s work, adding the effect of precession to the longitudes) induced him to redetermine the positions of 992 fixed stars, to which he added 27 stars from Abd al-Rahman al-Sufi’s catalog Book of Fixed Stars from the year 964, which were too far south for observation from Samarkand. This catalog, one of the most significant of the Middle Ages, was first edited by Thomas Hyde at Oxford in 1665 under the title Tabulae longitudinis et latitudinis stellarum fixarum ex observatione Ulugbeighi and reprinted in 1767 by G. Sharpe. More recent editions are those by Francis Baily in 1843 in vol. xiii of the Memoirs of the Royal Astronomical Society and by Edward Ball Knobel in Ulugh Beg’s Catalogue of Stars, Revised from all Persian Manuscripts Existing in Great Britain, with a Vocabulary of Persian and Arabic Words (1917). In 1437, Ulugh Beg determined the length of the sidereal year as 365.2570370…d = 365d 6h 10m 8s (an error of +58 seconds). For his measurements he used a 50 m high gnomon (shadow casting rod as on a sundial). This value was improved by 28 seconds in 1525 by Nicolaus Copernicus, who appealed to the estimation of Thabit ibn Qurra (826–901), which had an error of +2 seconds. However, Beg later measured another more precise value as 365d 5h 49m 15s, which has an error of +25 seconds, making it more accurate than Copernicus’ estimate which had an error of +30 seconds. Beg also determined the Earth’s axial tilt as 23.52 degrees, which remained the most accurate measurement for hundreds of years. It was more accurate than later measurements by Copernicus and Tycho Brahe. which shows the remarkable accuracy which Ulugh Beg achieved. Not a brilliant mathematician, but a dogged one. Ulugh Beg’s scientific expertise was not matched by his skills in leadership. When he heard of the death of his father Shahrukh Mirza, Ulugh Beg went to Balkh, where he heard that his nephew Ala-ud-Daulah Mirza bin Baysonqor, son of Ulugh’s brother Baysonqor, had claimed the emirship of the Timurid Empire in Herat. Consequently Ulugh Beg marched against his nephew and met him in battle at Murghab. Having won this battle, Ulugh Beg advanced toward Herat and massacred its people in 1448. But Ala-ud-Daulah’s brother Mirza Abul-Qasim Babur bin Baysonqor came to his aid, defeating Ulugh Beg. Ulugh Beg retreated to Balkh, where he found that its governor, his oldest son Abdal-Latif Mirza, had rebelled against him. Another civil war ensued. … the third cervical vertebra was severed by a sharp instrument in such a way that the main portion of the body and an arc of that vertebra were cut cleanly; the blow, struck from the left, also cut through the right corner of the lower jaw and its lower edge. 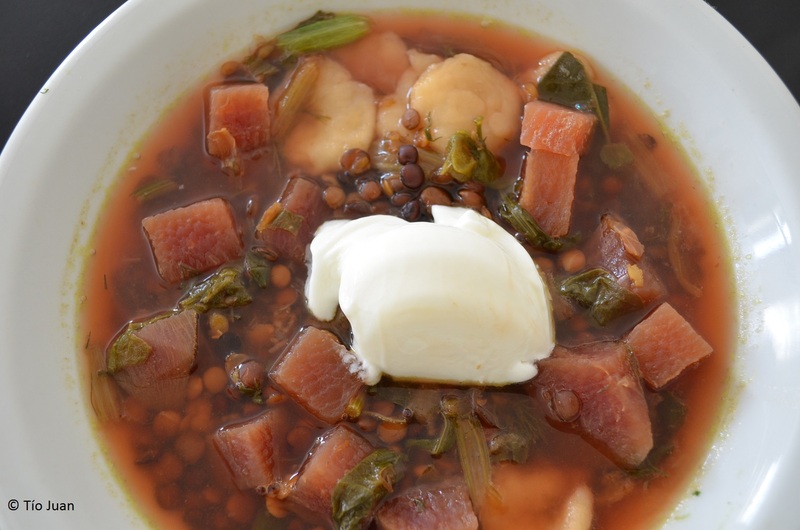 Here is a classic soup from Yazd, now in Iran but in the Timurid Empire when Ulugh Beg ruled. It is quite complex in flavor, but not awfully difficult to make. 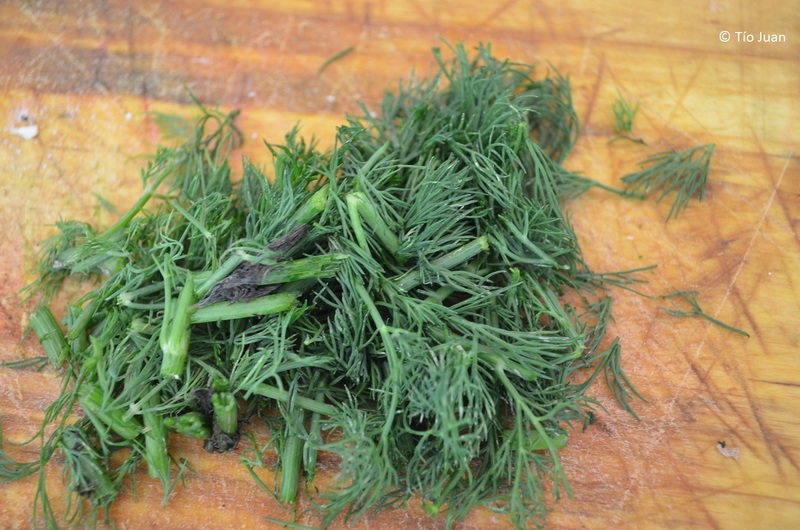 The dill and beets are a common taste of the region. The dumplings and yoghurt are essential for me to cut the richness of the soup. 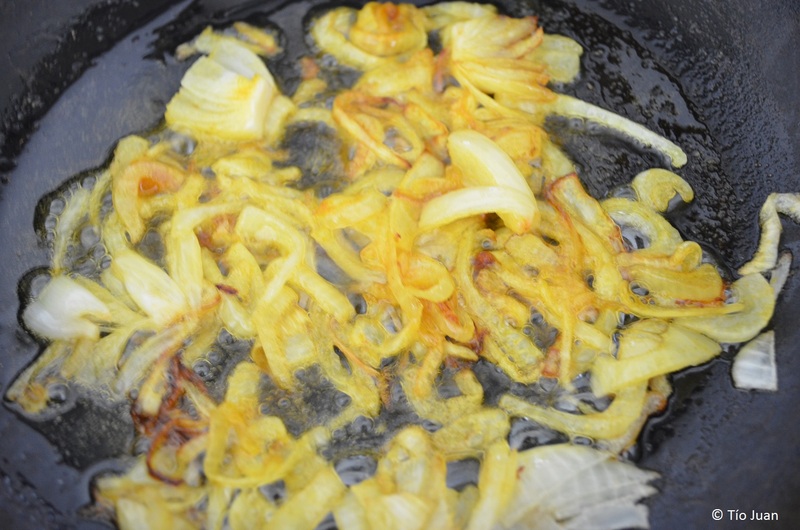 Slice a medium onion and sauté in a little oil until golden. Add ½ teaspoon of turmeric and sauté for a minute or two more. 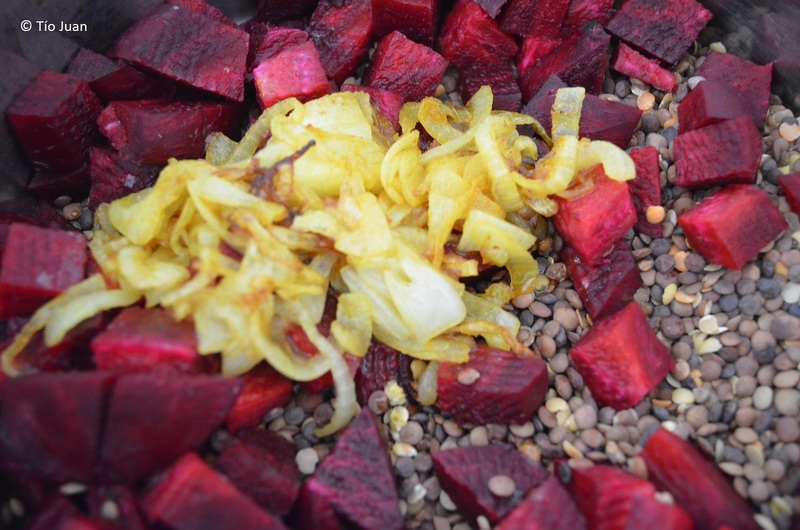 Put the onions in a soup pot with 1 cup of lentils and 1 cup of diced beet. 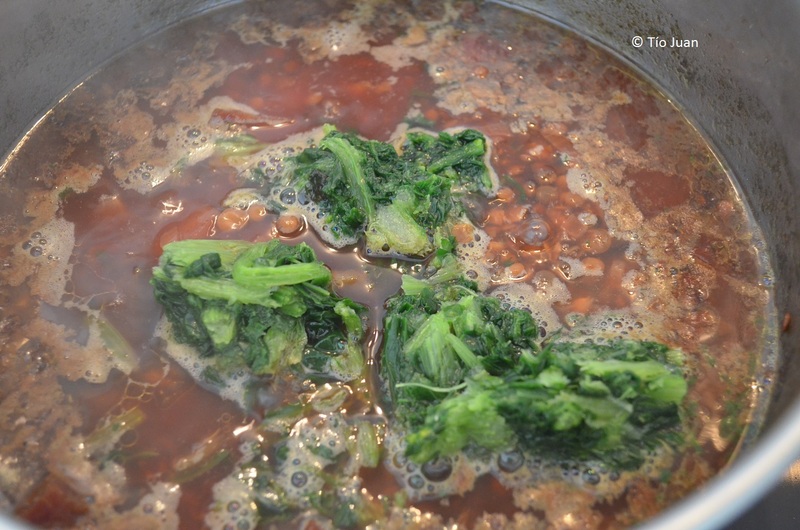 Add 5 cups of chicken stock, bring to a boil and simmer until the lentils are soft (1 to 2 hours). Add ½ cup of chopped greens (beet tops if available, otherwise chard or spinach) . . .
. . . and a handful of chopped dill. 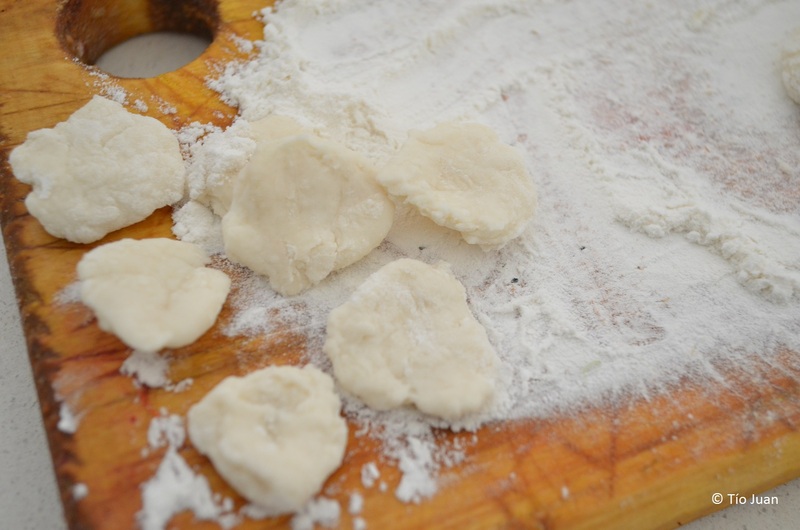 Continue to simmer while you make the dumplings. 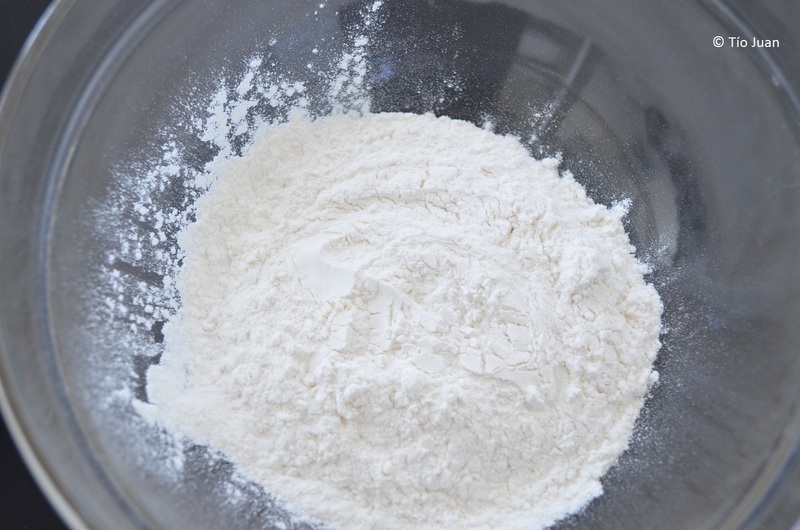 Place ½ cup of flour in a bowl. 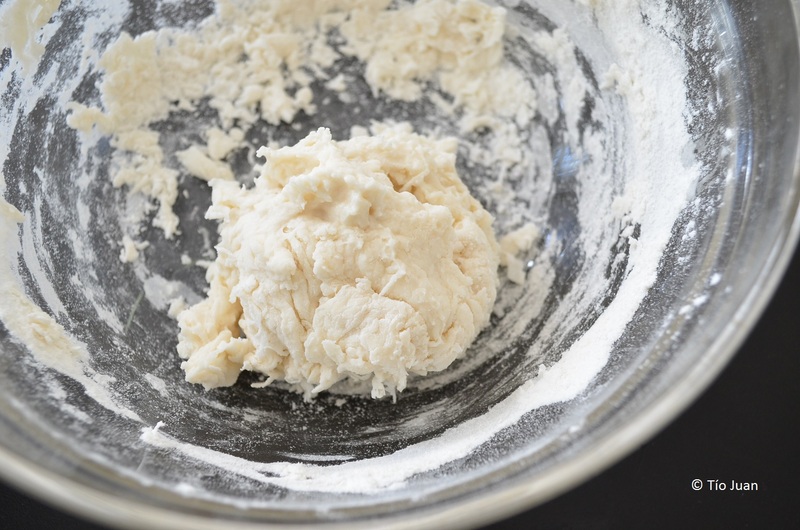 Slowly add water until you have a soft dough. 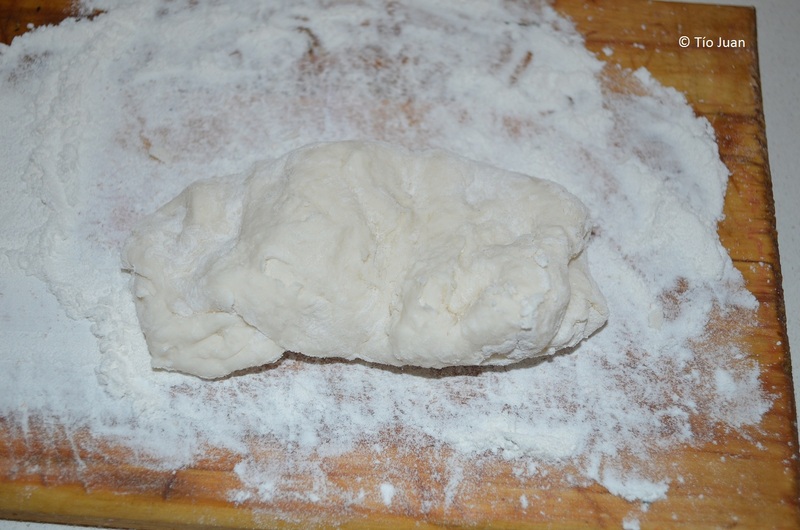 Knead on a floured board for 5 minutes. 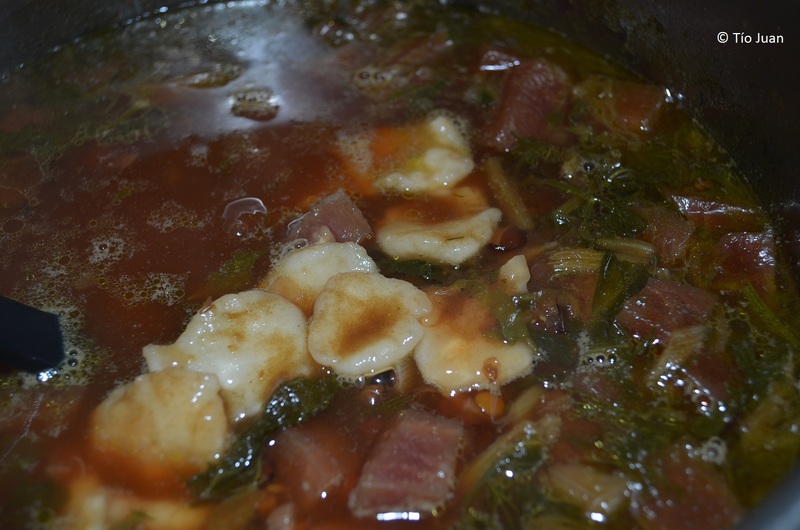 Add the dumplings to the soup and cook for 8 to 10 minutes, or until al dente. Add 2 tablespoons of vinegar. Serve hot in a deep bowl with a dollop of plain yoghurt or sour cream. It can also be served cold. 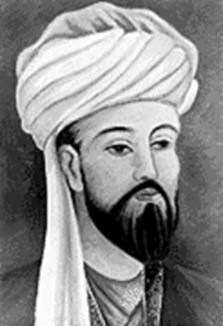 Today is the birthday (973) of Abū Rayḥān Muḥammad ibn Aḥmad Al-Bīrūnī ( ابوریحان بیرونی‎‎), commonly called Al-Biruni in English. He was a Muslim, Persian scholar who made contributions to a wide range of subjects including astronomy, mathematics, physics, history, geography, and cultural anthropology. 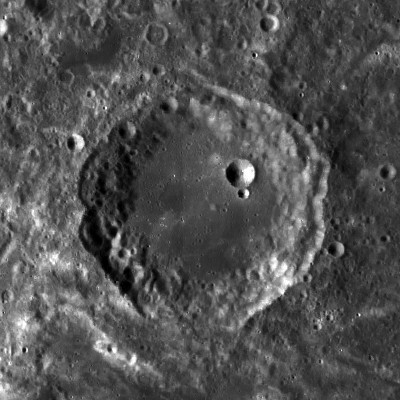 A crater on the moon is named in his honor. Al-Biruni was born in the outer district of Kath, the capital of the Afrighid dynasty of Khwarezm (or Chorasmia), now in Uzbekistan. 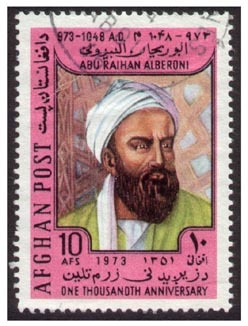 The word Biruni means “from the outer-district” in Persian, and so this became his nisba (sobriquet of affiliation): ” Al-Bīrūnī” = “the Birunian.” His first twenty-five years were spent in Khwarezm where he studied fiqh (Islamic jurisprudence), theology, grammar, mathematics, astronomy, medicine, and other sciences. His native language was the Iranian dialect, Khwarezmian, which is now extinct and about which very little is known. Al-Biruni wrote in Arabic, and was also conversant with Persian, Sanskrit, Greek, Hebrew, Syriac, and Berber. He was sympathetic to the Afrighids, who were overthrown by the rival dynasty of Ma’munids in 995. He left his homeland for Bukhara, then under the Samanid ruler Mansur II the son of Nuh. There he corresponded with Avicenna (Ibn Sina), famed polymath, and some of these letters are extant. In 998, he went to the court of the Ziyarid amir of Tabaristan, Shams al-Mo’ali Abol-hasan Ghaboos ibn Wushmgir. There he wrote his first important work, al-Athar al-Baqqiya ‘an al-Qorun al-Khaliyya (literally: “The remaining traces of past centuries” and translated as “Chronology of ancient nations” or “Vestiges of the Past”) on historical and scientific chronology, probably around 1000, though he later made some amendments. Accepting the fall of the Afrighids at the hands of the Ma’munids, he made peace with the latter who then ruled Khwarezm. Their court at Gorganj (also in Khwarezm) was gaining fame for its gathering of brilliant scientists. 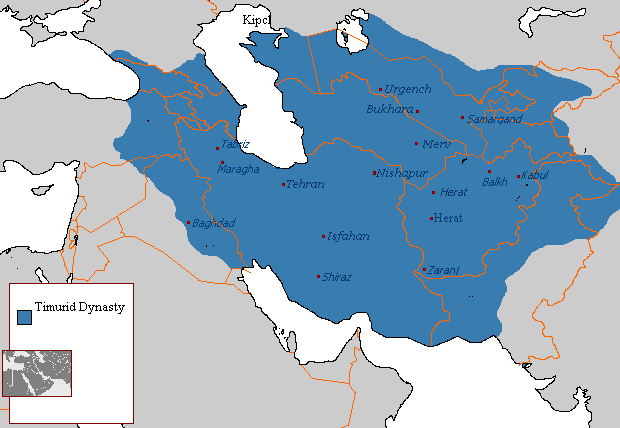 In 1017, Mahmud of Ghazni conquered Rey (now part of Tehran). Most scholars, including al-Biruni, were taken to Ghazna, the capital of the Ghaznavid dynasty. Al-Biruni was made court astrologer and accompanied Mahmud on his invasions into India, living there for a few years. Al-Biruni became acquainted with the culture and history India. During this time he wrote the Kitab ta’rikh al-Hind “(Book of Indian History”), finishing it around 1030. 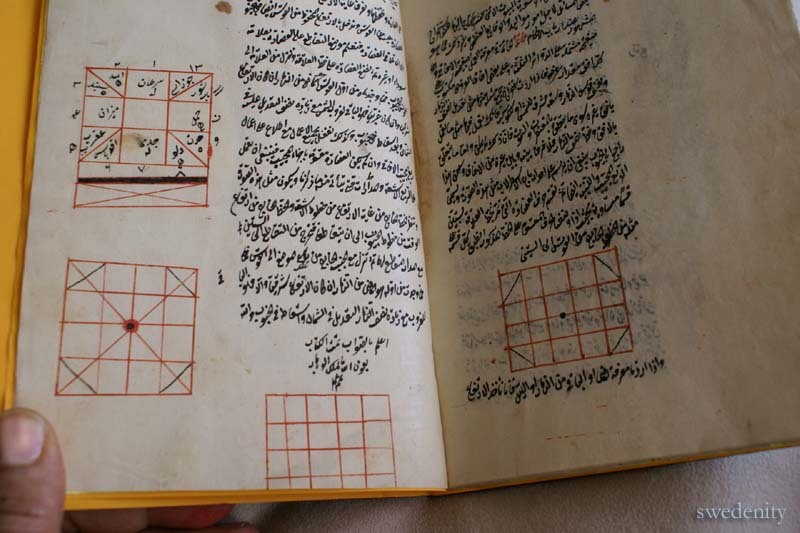 95 of 146 books known to have been written by al-Biruni were devoted to astronomy, mathematics, and related subjects like mathematical geography (geodesy). 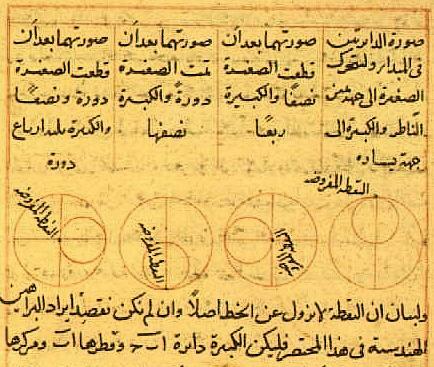 Al- Biruni’s major work on astrology is primarily an astronomical and mathematical text. Only the last chapter concerns astrological prognostication. His endorsement of astrology is limited; in fact he condemns horary astrology as ‘sorcery’. In discussing speculation by other Muslim writers on the possible motion of the Earth, al-Biruni acknowledged that he could neither prove nor disprove it, but commented favorably on the idea that the Earth rotates. He wrote an extensive commentary on Indian astronomy in the Kitab ta’rikh al-Hind, in which he claims to have resolved the matter of Earth’s rotation in a work on astronomy that is no longer extant, his Miftah-ilm-alhai’a (“Key to Astronomy”). 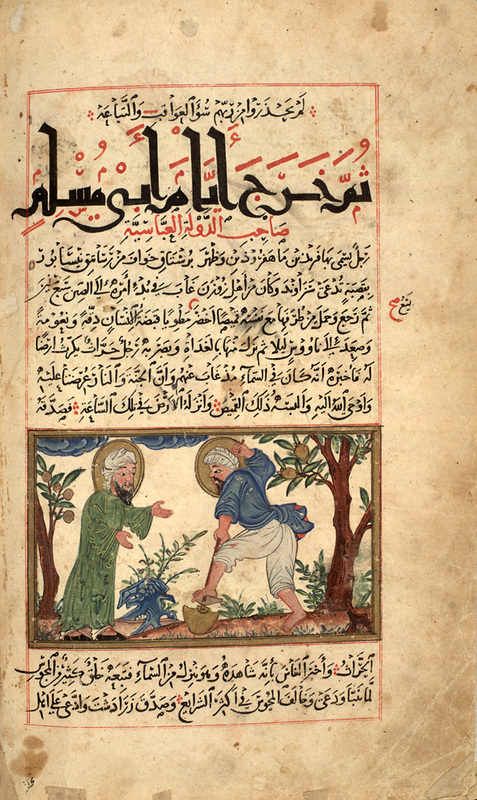 He carried on a lengthy and sometimes heated, correspondence with Ibn Sina (Avicenna), in which al-Biruni repeatedly attacks Aristotle’s celestial physics. He argues that by simple experiment a vacuum can be shown to exist; he is “amazed” by the weakness of Aristotle’s argument against elliptical orbits on the basis that they would create a vacuum; and he attacks the immutability of the celestial spheres. In his major extant astronomical work, the Mas’ud Canon, Al-Biruni uses his observational data to disprove Ptolemy’s theory of the immobile solar apogee which assumes the earth does not move. 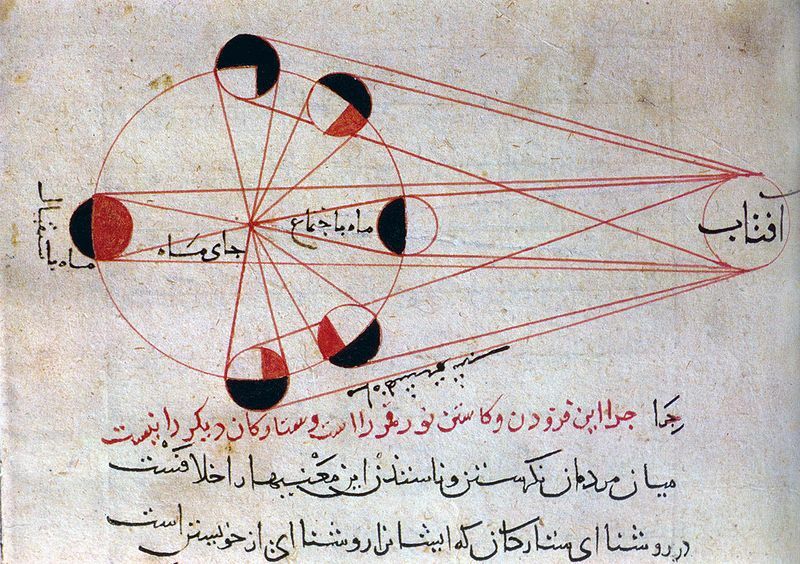 Al-Biruni’s eclipse data were used by Richard Dunthorne in 1749 to help determine the acceleration of the moon, and his observational data have entered the larger astronomical historical record, still used today in geophysics and astronomy. Al-Biruni is one of the most important Muslim authorities on the history of religion. He was a pioneer in the study of comparative religion. He studied Zoroastrianism, Judaism, Hinduism, Christianity, Buddhism, Islam, and other religions. He treated religions dispassionately, striving to understand them on their own terms rather than trying to prove them wrong. His underlying concept was that all cultures are at least distant relatives of all other cultures because they are all human constructs and that all humanity was united at one point in distant history. Al-Biruni was disgusted by scholars who failed to use primary sources in their treatment of Hindu religion. He found contemporary sources on Hinduism to be both insufficient and dishonest. Guided by a sense of ethics and a desire to learn, he sought to explain the religious behavior of different groups in their own contexts. As such he is a significant historical figure in the use of cultural relativism and avoidance of ethnocentrism in anthropology. An example of al-Biruni’s analysis is his summary of why many Hindus hate Muslims. He explains that Hinduism and Islam are totally different from each other, but that this is not the issue at stake. Hindus in 11th century India had suffered through waves of destructive attacks on many of their cities, and Islamic armies had taken numerous Hindu slaves to Persia. It was this militarism and not religious principles, according to Al-Biruni, that contributed to Hindus becoming suspicious of all foreigners, not just Muslims. Hindus considered Muslims violent and impure, and did not want to share anything with him. It was all about politics. Religious ideology had nothing to do with the conflict. Over time, al-Biruni won the welcome of Hindu scholars. He collected books and studied with these Hindu scholars to become fluent in Sanskrit, and translate into Arabic the mathematics, science, medicine, astronomy and other fields of arts as practiced in 11th century India. He was convinced by the arguments offered by Indian scholars who believed earth must be ellipsoid shape with a yet to be discovered continent at earth’s south pole, and that earth’s rotation around the sun is the only way to fully explain the difference in daylight hours by latitude, the seasons, and earth’s relative positions with moon and stars. Al-Biruni was also critical of Indian scribes who he believed carelessly corrupted Indian documents while making copies of older documents. Al-Biruni’s translations as well as his own original contributions reached Europe in the 12th and 13th centuries, where they were actively sought. While others were killing each one another over religious differences, al-Biruni, though Muslim, had a remarkable ability to engage Hindus in peaceful dialogue. Like Ibn Khaldoun (click here), who came 3 centuries after him, his researches were all guided by laudable principles we would do well to follow: use primary sources whenever possible, check everything against other sources or through experiment, and do not bring your own biases to any investigation. Al-Biruni’s birthplace is now in Uzbekistan. Uzbek cuisine is quite similar to the cuisines of Eurasia in general – rice pilaf, kebabs, stuffed vegetables. Here is a pilaf I like (plov in Uzbek). Naturally its main ingredient is rice, but the use of greens suffuses the whole dish with a special savor. My technique is not quite the traditional one but I like the results. Traditionally you brown the lamb and onions then add the greens for a quick sauté. Finally you add the rice and liquid and leave it all to steam, covered. My experience has been that the 20 minutes or so it takes to cook the rice is not enough to make the lamb tender. So I precook the lamb before adding the greens and rice. You can use any rice, but I prefer basmati for this dish. A tender cut of lamb such as leg is best. You may also use beef instead. Heat 2 tbsps of the butter over medium high heat in a Dutch oven. 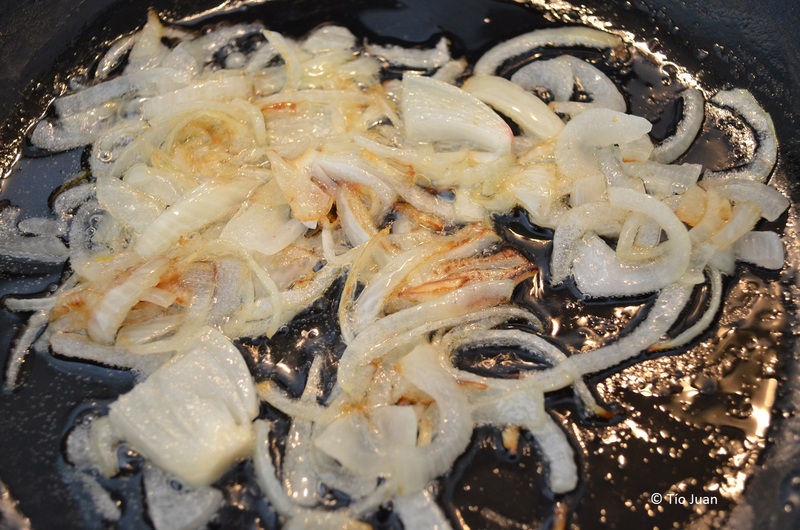 Sauté the onions until translucent and set aside. Brown the meat. Add the stock and simmer gently for 30 minutes. 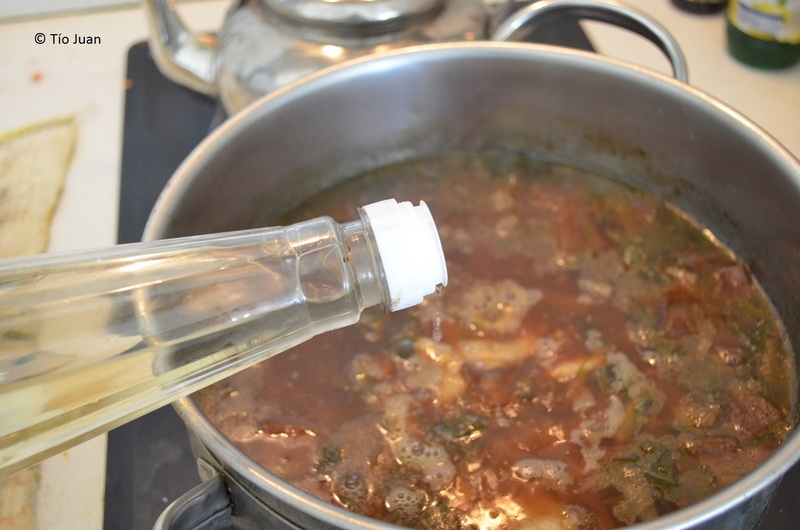 Remove the meat from the stock and set aside. Pour off the stock and reserve. 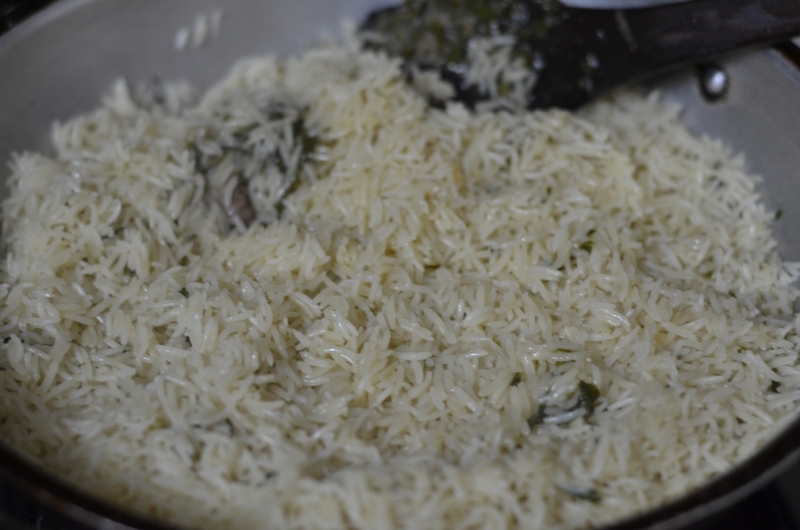 While the meat is cooking thoroughly rinse the rice until the water runs clear. Rinse the spinach and drain, but leave water clinging to the leaves. Clean out the Dutch oven, return to the stove and add the remaining butter. Heat over medium heat. Add the onions and meat to heat through. Turn the heat to medium low and stir in the spinach and cilantro. Then add the rice and stir to mix. Add one cup of stock, turn the heat to high, and let it boil. Add salt and spices. Observe how much liquid is in the pot. It should cover the rice by a little less than an inch (2 cm). Add more stock if there is not enough. Let the pot boil until all the liquid is evaporated. When all water is evaporated, mix only the top of pilaf. Set the heat on low, cover with a lid and cook for about 20 min. Open up the lid after 20 min and again mix only the top of the pilaf. Check to see if the rice is cooked. If not, cover and cook until done. Uncover and mix all the ingredients together. Serve on a large platter with a salad of your choice (tomatoes and onions are traditional). We know quite a few details about Nilakantha’s life because he was, unlike his contemporaries, careful to document many autobiographical details. So, for example, he notes in Siddhanta-darpana that he was born on Kali-day 1,660,181 which works out to 14th June 1444. His date of death is not known, but one commentator says he was at least 100 years old when he died. Nilakantha was born into a Namputiri Brahmin family which came from South Malabar in Kerala, in the south of India. The family followed the Ashvalayana sutra which was a manual of sacrificial ceremonies in the Rigveda, a collection of Vedic hymns. He worshipped the personified deity Soma who was the “master of plants” and the healer of disease. This explains the name Somayaji which means he was from a family qualified to conduct the Soma sacrificial rituals, and probably at some time in his life went through a series of these rituals to earn the title. In Nilakantha’s time the study of astronomy was one of the six orthodox Hindu sacred teachings, and so lay somewhere between what we would call astronomy and astrology today. Studying the motions of the planets was not simply a scientific investigation, but a means of predicting and setting the times and dates for significant rituals and life events. He became a member of the now famous Kerala School of Astronomy and Mathematics which flourished between the 14th and 16th centuries, and which produced a number of significant mathematical findings well before they were discovered in the West. These findings never found their way outside of Kerala at the time, however, although there are occasional far-fetched speculations that they reached the West via traders. In all, Nilakantha wrote 10 treatises on astronomy and mathematical computation, a few of which have survived. The most extensive is the Tantrasamgraha, completed in 1501, which consists of 432 verses in Sanskrit divided into eight chapters, and which spawned a number of commentaries, also extant. The work, plus commentaries, shows the depths of the mathematical accomplishments of the Kerala School, including Nilakantha’s model for the motions of the planets Mercury and Venus. His equations remained the most accurate until the time of Johannes Kepler in the 17th century. He was very close to describing a heliocentric view of the solar system. His model has Mercury, Venus, Mars, Jupiter, and Saturn orbiting the sun, but has the sun orbiting the earth. The work also includes a wealth of information on topics ranging from the prediction of lunar and solar eclipses, to accurate calculations of the solar calendar, along with descriptions of the mathematics needed to arrive at their conclusions. Among these latter are algebraic and geometric theorems that form the basis for differential and integral calculus, although the Kerala School never got that far. Much of the mathematics in the treatise predates Western discoveries in these fields by 200 years. Several other of Nilakantha’s works survive although they are much shorter. 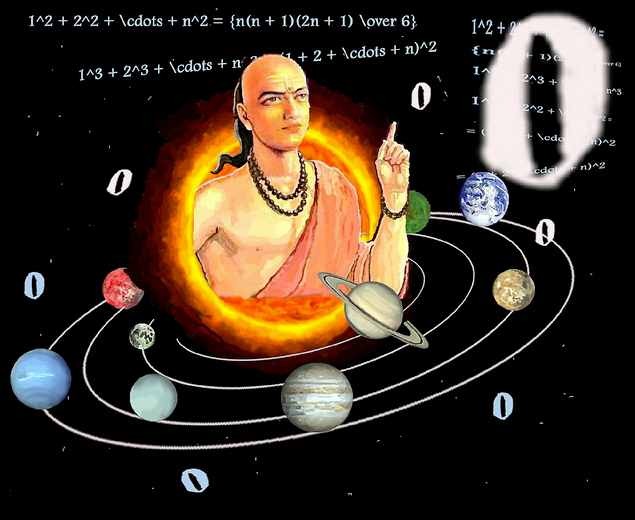 Among them is the Aryabhatiyabhasya which is a commentary on the astronomical calculations of Aryabhata. In this work Nilakantha refers to two eclipses which he observed, the first on 6 March 1467 and the second on 28 July 1501 at Anantaksetra. Nilakantha also refers in the Aryabhatiyabhasya to other works which he wrote such as the Grahanirnaya on eclipses which have not survived. The Western world of mathematics and science is finally giving credit to pioneers in their fields in the non-Western world. It is well overdue for the general public also to accept the fact that the Western world has made many significant discoveries in these fields but was by no means the first for many of them. Nilakantha Samayaji should be as well known a name as Copernicus, Galileo, and Newton. Kerala was the center of the spice trade for millennia and, as such, has a rich and diverse cuisine to this day, including both vegetarian and non-vegetarian dishes. Here is a simple vegetarian curry with spices and coconut milk. It would normally be served with anywhere up to 10 or more dishes with rice as part of a large family dinner. Put all the ingredients except the coconut milk and coconut oil into a heavy cooking pot. Add 3/4 cup water. Bring to a boil. Cover the pot and simmer on medium heat for 5 to 10 minutes. The potatoes should be cooked but still firm. Remove the lid and continue cooking until there is barely any liquid left. Add the coconut milk and simmer over a low flame for 2 minutes. Add the coconut oil, stir to mix and serve.